Welcome to Marvel Strike Force Heroes page. This is the full description of MSF Bullseye stats, skills and abilities. Bullseye is a Mercenary Blaster who harasses enemies with massive damage to the single target. Bullseye first skill hits hard and has increased critical chance. His second skill grants even greater damage and has a chance for a bonus attack on the same target with an increased critical chance. Bullseye ultimate inflicts 500% of his base damage and has increased critical damage. Bullseye is one of the best damage dealers in the game and he is very handy for Blitz, Arena, Catalyst of Change Challenge and Villains United Campaign missions. He can be obtained early in the game and investing resources in him is a very smart move. His cost is 15 shards which are obtainable through premium orbs, 2-6 Heroes Assemble campaign mission and 1-3 Villains United campaign mission. 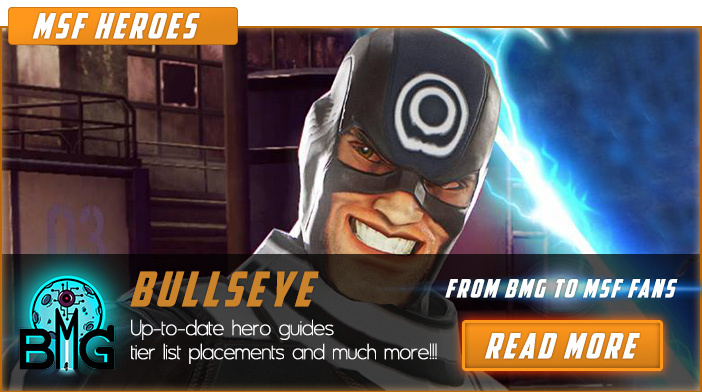 We hope that you enjoyed the description of MSF Hero Bullseye. For detailed information about other MSF Characters check our MSF Heroes page.